I sit here tonight… a very blessed woman. I have four beautiful daughters whom I adore. I have parents who showed me Jesus when I was young, and pointed me toward the Light. I have a little brother who, even though he can be a dweeb at times, also has a sweet sweet heart. I have a job that helps pay the bills, is flexible with my current schedule, and provides health insurance. I have money to buy food. I have wonderful people who are helping BRING food to our house a few times a week too! I have in-laws who have dropped everything to come and help us when needed. I have friends who support me, uplift me, pray for me. 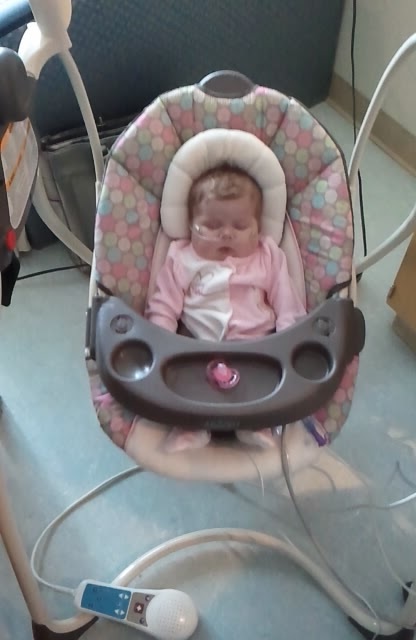 I have a daughter with half of a heart who is stable, sleeping, and alive. And even if all those things were taken from me tomorrow… I would still have God. I look over at my Annabelle tonight, asleep with her cute PJ’s on, tucked under the blanket with her dolly, and I’m overwhelmed. With love. With hope. And to be honest, a little fear. Downstairs tonight, there is a little both who is receiving his heart. He has been waiting a very, very long time for it. Please, pray for him this evening, that the transplant goes well, that he recovers quickly, and that he can finally go home again. I first met his mom about a month or so after Annabelle was born, and when she told me they’d been here since May, waiting for a heart, my jaw dropped. MAY??? That was like over 3 months. I couldn’t fathom being in the hospital that long. Now, we are going on six months ourselves, and it’s been eight months for little Nathan. To see a little of Nathan’s story, here is a little video on Vanderbilt’s website. It highlights the need to make up your mind about organ donation BEFORE something happens. Whether it’s discussing it with your family for yourself, or with your spouse about your children… it’s important. That may seem yucky. And it is NOT a pleasant topic, I’ll give you that. And my heart is breaking in two right now, knowing that another family has said goodbye to their child today. Please add them, whoever they may be, to your prayers as well. But I look at my three healthy children, at myself and my husband, and know that we don’t live in a bubble. Accidents happen. It’s a choice that I never really thought about before, but especially now, would make in a heartbeat. If our loss could save lives, well, it doesn’t make the loss easier, or “worth” it, but it does bring something good out of something painful. Annabelle is sleeping peacefully tonight. We got our PICC line in on Tuesday, and spent last night in the ICU just to monitor her. She has been fever free for SIX WHOLE DAYS now! Which is pretty amazing since we really didn’t know what caused the fevers in the first place and we’d been having them close to daily since December 14th. We are finalizing all the details of listing for transplant, getting the last of the blood-work in, then sending off for pre-approval from insurance. Our hope is to get officially on the “list” on Friday or Monday. So I’m trying to do like I’ve done for the last six months. (pretend I’m drawing an imaginary box…) I’m living in my 24 hour window. I do what needs to be done, today, with God’s strength, and trust him with the tomorrows. I’ve quoted this old song probably more than once in the past year, but I’ll quote it again because it is my favorite and is exactly what I need to remember on this revised journey of ours. I pray you walk in Jesus love today, and know His peace, and trust Him with your tomorrows. Praising God that Annabelle has been fever free for six days. Praying for Nathan, his family, his medical team, and the family who made the choice to give the gift of life. Praying for you and Scott as you go through the steps to get Annabelle on the transplant list. Amazing… I love the counting your blessings part! Amen and Amen. In the midst of drama and turmoil, to thank God is the ultimate praise. He is well pleased with you, dear one. You are my hero. She looks so at peace in her little swing!!! A little teary here thinking of the family who lost their little one and giving the heart to Nathan. Will be praying for them. Do they let these people meet? I'm sure they'd want to know the little guy that got their precious one's heart… Sending hugs to you and Annabelle!!! How wonderful to read all your belssings! You are really blessed! God Bless you Krista – you are an inspiration! Praying for continued blessings – He truly holds tomorrow and he holds your (and Annabelle's) hand! Abundatly, amazingly, blessed. Keep living in that 24 hour window, God will give you just enough for that moment! What a great blessing you and your family are to so many people, especially those around you in that hospital. I will keep praying! I will be praying for Nathan and Annabelle. I love the cute picture of her! I gave you a blog award, check out my blog for details! Have a great weekend!